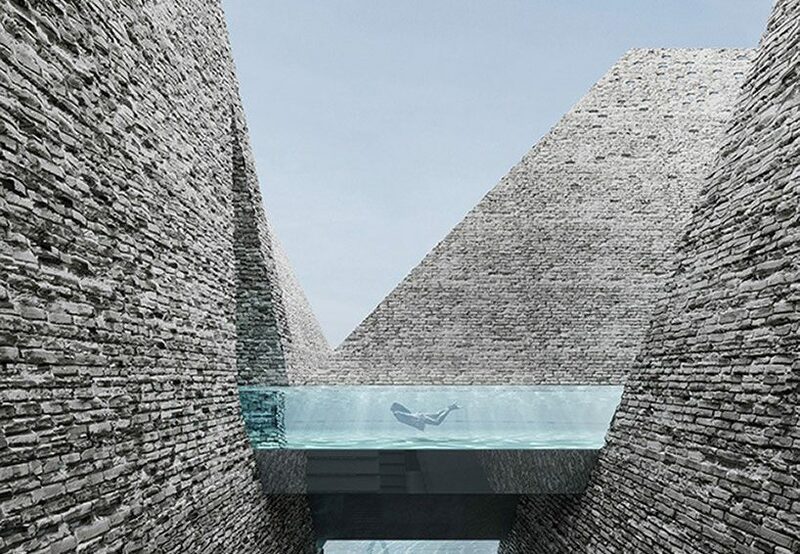 whether its dipping your toes into a dramatically cantilevered body of water, or taking a dive into a glass-bottomed roof top, the best swimming pools are often the places where architects and designers have dreamt up the impossible. riffing on a feature that traces back to ancient civilisations, over time places to swim or bathe have been used to conduct religious ceremonies, offered a place to socialise, and of course, contained many a famous athlete, not to mention revolutionising a sense of hygiene that has developed over centuries. today, pools are fast stead becoming an important part of everyday life. from an expected amenity at the local gym, to the highlighting feature of an architectural development, be it a hotel, residential complex, or home improvement. with temperatures rising what better time than for designboom to reflect on the glistening waters that have made for some of our best swimming pools, featured in projects and proposals over the years. 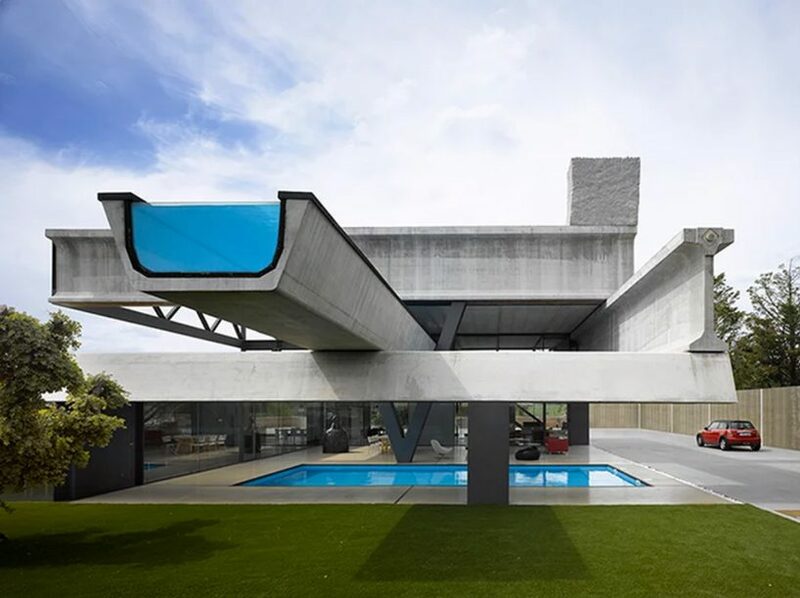 the most dramatic gesutre in the hemeroscopium house is the long, thin swimming pool, suspended in mid-air on it’s upper level, complimenting the second one that lies just below it. created by ensamble studio the property consists of seven prefabricated elements, one of which is filled with water, using a rock to counterbalance the cantilever and challenging the concept of weight. kengo kuma & associates‘ designing for an aquatics centre on copenhagen’s harbour, features a series of indoor of pools defined by the exaggerated scale of brick pyramids framing them. located in paper island, the design aims to highlight the significance of water in the history, culture and vibrant urban life in the city. the proposal offers diverse experiences of water in various states and conditions such as reflection of light and shadow, steam and flow that appeal to human senses. 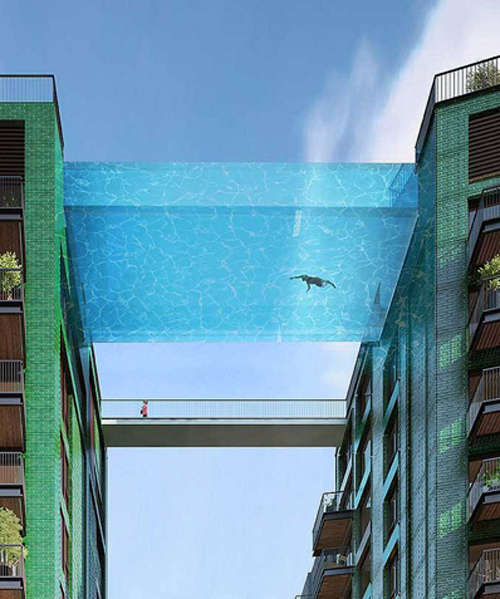 labeled as a ‘world’s first’, a 27 meter-long (90 feet) glass bottomed swimming pool links plans for two apartment towers in south london. the legacy buildings at embassy gardens, which forms part of a riverside district in south london has been designed by HAL architects and once completed, will bridge the gap between two ten storey structures. when a young couple requested a summer house with a generously proportioned pool, spanish architecture practice, serrano + baquero, decided to completely merge the two. 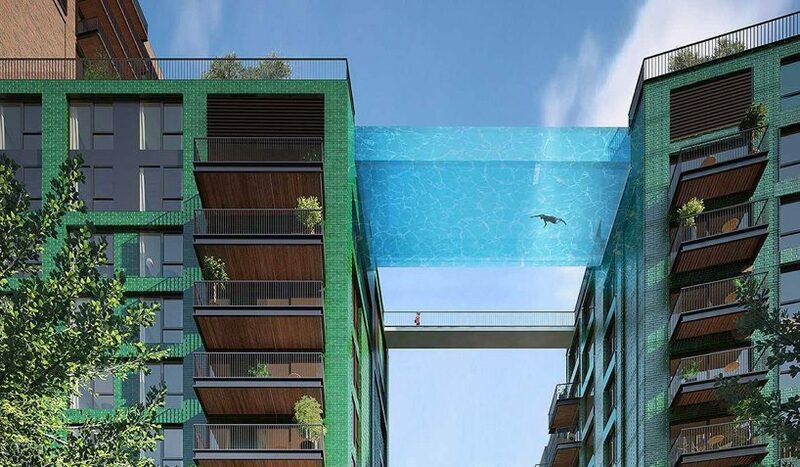 one enters the proposed dwelling underneath the elevated swimming aera, before a journey of ascension through the interior begins with each subsequent space highlighting another area of the pool. this central water feature for a mallorcan hotel by a2arquitectos is characterized by its bright yellow face. a vivid shade of yellow and a diameter of 12 meters make it unique in form and color compared to the crystal blue waters of rectangular pools often found at hotels. 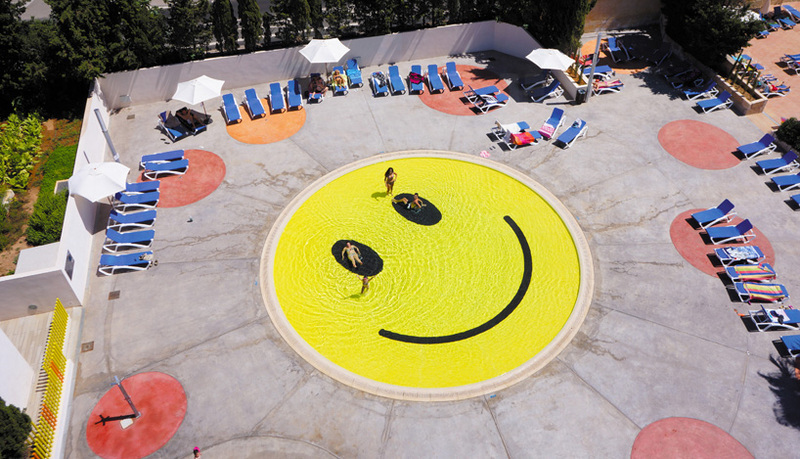 the firm created ‘smile pool’ as an extension of recreational activities and entertainment for young guests. bjarke ingels group’s (BIG) latest harbour bath forms a floating artificial island off the coast of denmark’s second-largest city. 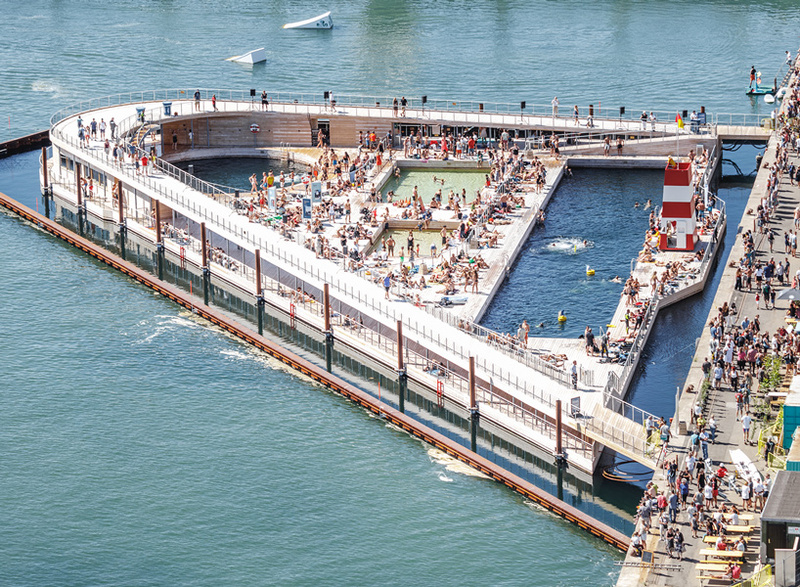 believed to be the largest seawater structure of its kind, the aarhus harbour bath complex features a 50-meter-long swimming pool, a children’s pool, a diving pool, and two saunas. accessible to the public for the first time this year, the complex will remain open between the hours of 11am and 7pm until the end of august 2018. 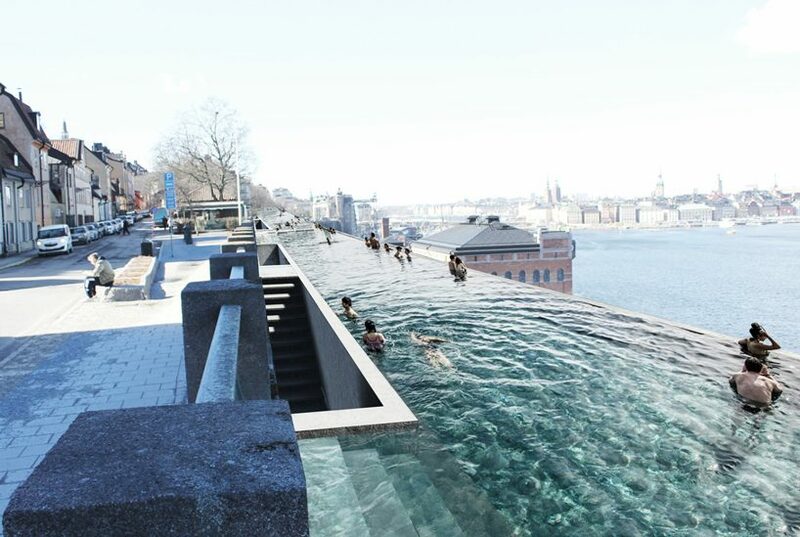 UMA proposes a public infinity pool in stockholm so tourists and can soak up the views whilst soaking themselves. stretching from the central northern are of slussen, all the way to the eastern point of the island, the infinity pool spans over one kilometer and is designed to feel as though it connects with the baltic sea below. 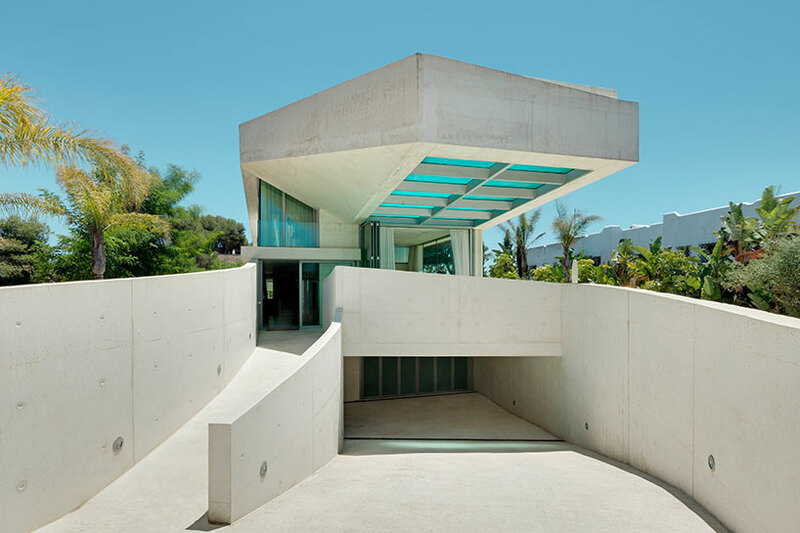 ‘jellyfish house’ by dutch practice, wiel arets architects, features a swimming pool that is cantilevered almost 30 feet out towards the surrounding mountains. weighing over 66 tons, the projecting mass features a glass bottom exposing swimmers to the outdoor deck below as well as a live screen visible inside the home filtering natural light through the water. the modpool is the smart shipping container pool for your back garden. the canadian brand utilized the structural rigidity of a modified shipping container to create the fully app-controlled and versatile pool. water temperature can be dictated from anywhere up to 30 degrees to -10 degrees celsius. meanwhile a divider and a semi-shut lid transforms it into a hot tub. 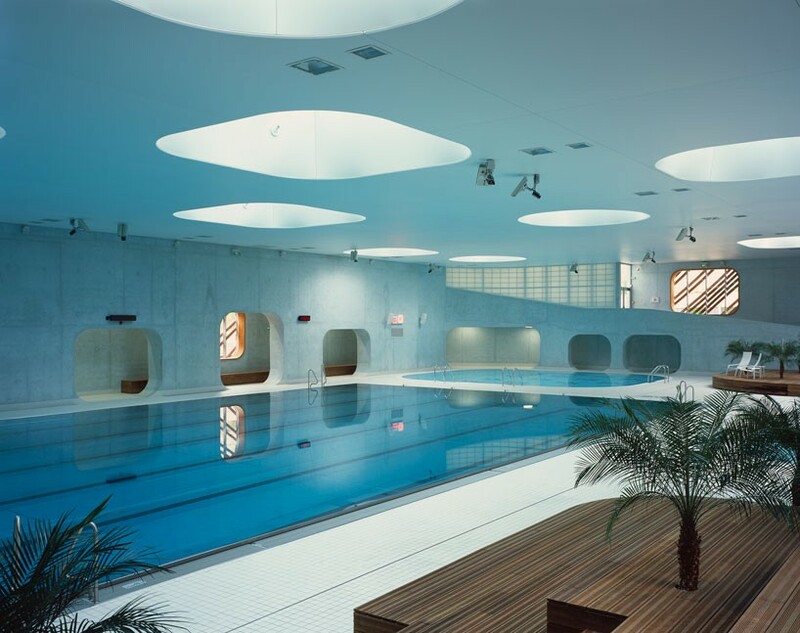 rounded off skylights illuminate this public pool by mikou studio design, meanwhile mirroring shapes help users to navigate the space. conveying a feeling of fluidity and openess, the spatial arrangement gives priority to transparency and the depth of field – accentuated by strong use of natural light. the studio collaborated with feng shui specialist laurence dujardin, dictating the the undulating, double skin façade: a sculptural envelope which uses warm wooden slats that recall the circular movements on the surface of water; drawing influence from the circulation of energy and flows.